Everybody stay on topic. The topic is the Status of Nautilus 3.30, not alternatives nor customizing nor other non-germane opinions. Please open separate threads for those flights of fancy. @khurshid-alam I also would prefer to see zeitgeist support dropped from Nautilus. I don’t think that we should continue to carry zeitgeist in Ubuntu main any more, but nautilus is the blocker for demoting zeitgeist to universe. totem also has a zeitgeist plugin (used by Unity I believe), but that plugin can be easily moved to totem-plugins-extra or a separate package. If we want to make it a separate package, now is a great time to decide on that since Debian won’t allow any new packages into Debian 10 “Buster” after early February. @chanath Respectfully, that’s off-topic for this topic. should I see home folder and trash on my desktop as in 1st post of this site? in my Home window I see ‘examples.desktop’ but if i click on it i see the content just as text. I don’t like the idea of extension. I prefer to change the file manager, but Nemo, Caja and elementary Files looks outdated. I can create a fork of Nautilus and return in it desktop icons. I already came up with the name, but I now will not say. This is a secret. I can create a fork of Nautilus and return in it desktop icons. nautilus arrived today on Disco with icons on the desktop. .desktop files must be authorized to run, .jpg and .png images appear as miniature and can be open, .ods open correctly but .txt files does not open. Ran update and I have it, testing out Desktop icons. Don’t see some of that at all. 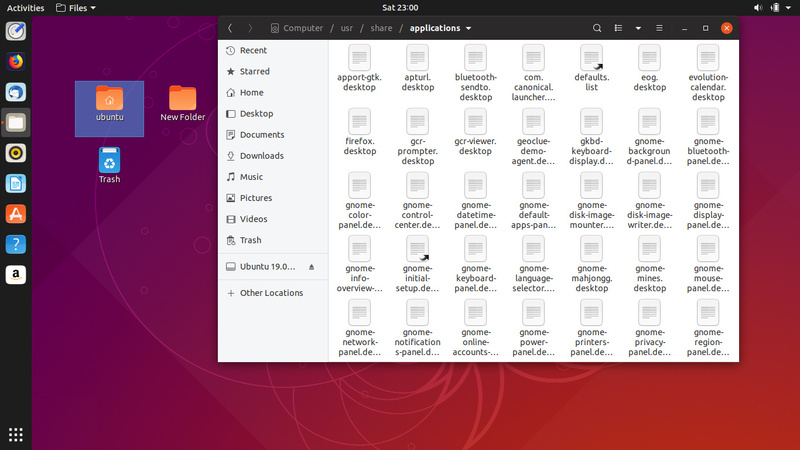 It is like the desktop as a file in a folder, the folder being the home folder, in this case Ubuntu. You cannot uninstall the home folder from the desktop. You can’t pull any .desktop file to the desktop, it just runs back. Same with a image, just runs back to the Picture folder, from which I tried to pull it to the desktop. Neither a .txt file. Everything runs back. There aren’t any icons shown for .desktop files. You can drag or copy & paste an image to the Desktop folder, which in turn appears on the desktop, but you cannot drag it from the desktop to any place. it runs back. 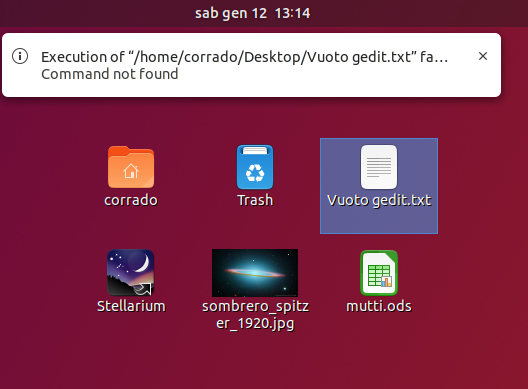 You can drag the New Folder you created on the desktop to you Home folder (Ubuntu here), but you can’t drag it back to the desktop. It runs back. It is same with any .txt file or anything else. It just runs back. These are first observations. I’m sure it’d get better in the near future. Yes, drag and drop isn’t supported. Drag & drop had been there since 1970 starting at the first Macintosh Project for Apple, and it is the cornerstone of using computers. Complain to Gnome about it. Not here. Stay on topic. There is a new extension, that allow management of the desktop icons. All the desktop-icons-extension behaviors that look like bugs for you should be reported to the project itself. Complaining here does not help you in the first place. So, what do you think? Should we give feedback here, or go look for the guys, who might be creating this extension? If you want any feature or bug fixing on the new extensions, I believe you should reach Soriano and the team behind that extension first. Here you can find other people willing to help for sure.